This stew is a wonderful dish to make early in the day – or even a day ahead of time – to allow the complex flavors to mellow and develop. Keep in mind that the beef and vegetables in this recipe must be marinated for 12 to 24 hours before you even start the cooking process. Cook’s note: Recipes from Provence are commonly served with rice. I took the liberty of using basmati rice, for its wonderful aroma and smooth flavor. Use your favorite rice as a substitute. Place the cinnamon stick, orange zest, bay leaf, thyme, parsley, peppercorns, cloves, and celery leaves onto a single layer of cheesecloth. Tie the cheesecloth up to make a bouquet garni, and set it aside. Gently toss together the celery, onions, garlic, carrots, beef, bacon, and bouquet garni in a large, non-reactive dish. Pour the wine and Cognac over the mixture and refrigerate it for 12 to 24 hours. Remove the beef from the vegetables – reserving the vegetable mixture - and allow it to drain onto clean kitchen towels. Toss the beef with the flour and brown it in the hot oil. Remove the beef from the skillet and deglaze the pan with the beef stock and tomato paste, scraping up the browned bits from the bottom of the pan. Combine the beef, pan sauce, olives, salt, and the vegetable-wine mixture in a large ovenproof dish and cover. Braise the beef for 2 1/2 to 3 hours, until the beef is tender. Check to see if there is too much liquid in the pan about 2 hours into the cooking time. If you want a thicker stew, remove the lid for the remainder of the cooking time. Cook the rice according to package directions. Remove the bouquet garni and serve the stew, garnished with the chopped parsley, over hot, cooked rice. 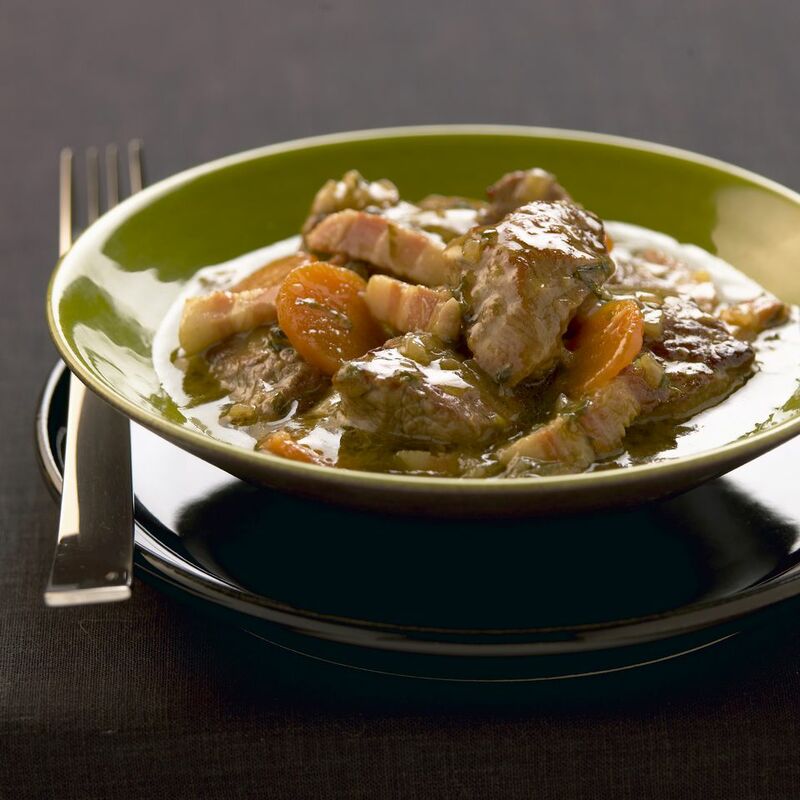 This daube de boeuf Provencal recipe makes 6-8 servings.